The best version of this classic you've ever performed! Imagine plunging a stainless steel needle through a seemingly fragile balloon - and the balloon not popping! The Magical Needle Through Balloon allows you to do just that. In this version of the trick, you are supplied with detailed instructions, five feet of yarn (for an additional handling of the trick), an authentic, high-quality British-made 16" stainless steel needle, and enough balloons for one dozen performances. 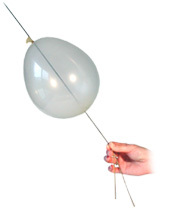 Superior quality of materials makes the "Needle Thru Balloon" the finest on the market.